It is always interesting to look at how markets respond to economic data: last week’s PMI data from Germany and France has raised concerns about global growth, especially as the US yield curve inverted (the yield on short-term/3 month US debt is now greater than that on long-term/10 year US debt for the first time since 2007), hence why global equity markets have been mixed this week. While we appreciate that economic data has been a little underwhelming of late, it is far too early to ring the recession alarm bells, as the data hasn’t actually changed that much – it is simply the way the market has responded to it. Although this past week has been light on important economic data, the readings that were released were far from gloomy. For example, Monday’s (25 March 2019) Chicago Fed National Activity index came in slightly better than expected for February and its January reading was also revised up. Additionally, we have long argued that a by-product of the global finance crisis in 2008/09 has been that global economic growth has been mostly steady (and at times anaemic) and non-inflationary – and that we believe that this is the new normal. There is an old saying that ‘when the US sneezes the world catches a cold’. And while we appreciate that US economic growth is forecast to slow from 2.9% in 2018 to around 2% in 2019, 2018 benefited from Donald Trump’s tax reforms – so 2019 was always going to be a slower year. And 2% US economic growth, coupled with continued job creation, certainly doesn’t suggest that the US is sneezing, let alone that a recession is imminent. In the UK, we have had another week full of Brexit drama which didn’t yield much change. It is amazing to consider that today (Friday 29 March 2019) was meant to be Brexit Day and yet we still don’t know whether Brexit will actually happen (and if it does, what kind of Brexit it will be). Although Theresa May’s deal was shot down again this afternoon, we may soon have some Brexit clarity – not because MPs all of a sudden get their act together, but because of European elections in May 2019. However, given the majority of MPs are opposed to a no-deal Brexit, the most likely option now, in our opinion, is a further Brexit delay (although as we have said before, that is not the result that companies want – as it simply prolongs the uncertainty that has already hit business investment). 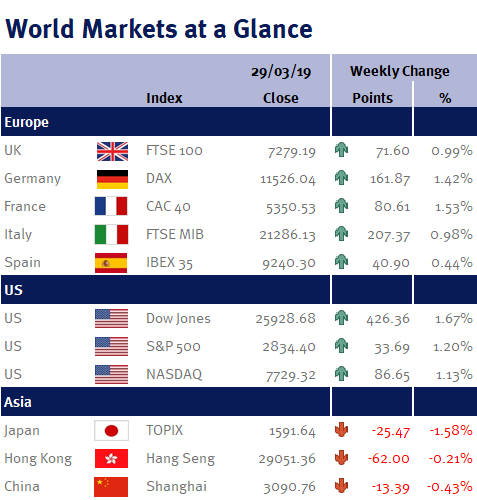 This coming week, we have elections in Ukraine and Turkey; US and eurozone retail sales; Chinese PMI; US employment data (non-farm payrolls; unemployment rate; the participation rate; and average earnings); eurozone unemployment; and eurozone CPI.